When a small club do well in Argentina, there’s a pattern which is generally followed in terms of what happens next to their players: they move to River or Boca, and from there, if they continue to shine, on to Europe. This year though, Lanús have impressed so much that an exception may be about to occur – Diego Valeri has already been looked at by Juventus and Atlético de Madrid, and now Italian champions Internazionale could be about to weigh in with a serious offer. Inter, of course, are no strangers to fielding Argentines – at last count they had 534 in their first-team squad. OK, seven. That’s still a lot. The signing of Colombian defender Nelson Rivas from River Plate back in August also showed that Inter maintain a good scouting network in Argentina, not that they’d have needed a particularly sharp eye to have spotted the best player of the 2007 Apertura. 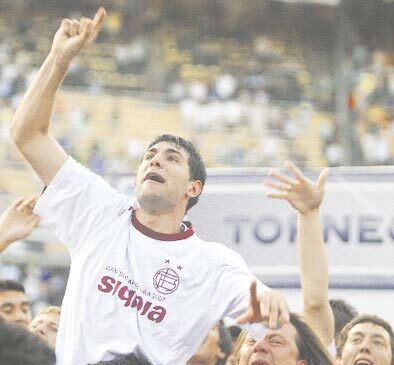 Lanús still want, of course, to keep hold of Valeri if it’s at all possible, but the size of Inter’s offer might well take the issue out of their hands – reports from Italy suggest the club of Hernán Crespo, Javier Zanetti, Esteban Cambiasso, Walter Samuel, Julio Cruz, Nicolás Burdisso and Santiago Solari are prepared to pay US$8 million to make Valeri their eighth Argentine, and the playmaker’s (legally obtained) Italian passport will smooth the way to putting the deal through. As yet, Lanús are insisting they haven’t been contacted by anyone from Inter – but concede that Valeri’s agent is in Italy talking to certain parties, and that they expect to hear something from him in the coming days. With Inter sitting top of Serie A, could he win two domestic titles in two countries in one season?